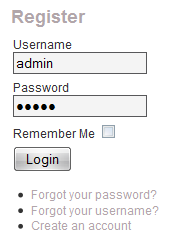 How to make Joomla 1.5 Automatically Log in the user after Registration. This change will log your Joomla 1.5 users in to your site as soon as they have completed the registration process. This works only if the user doesn't have to confirm his/her registration by email. The registration welcome email will still be sent. Open file joomla_root/components/com_user/controller.php in any text editor and go to line 282. Now as soon as they have clicked the submit button their username and password will be filled in and they will be logged in to the front page. If you would like them to be redirected to a special welcome page, thank you etc then change this line to the required page - e.g.